Even though North Carolina is known for its mild weather, the temperature can still drop pretty low in the winter season. You don’t want to be caught without proper heat on those chilly January days. 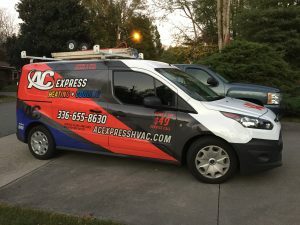 AC Express Heating & Cooling LLC of Clemmons and Winston-Salem, NC can make sure your home’s heating and ventilation system is running smoothly so you can stay warm and comfortable all winter long. Is your heat not working? It could be time to replace your heat pump. It may be tempting to try and fix the problem yourself, but be warned: heating repair is not as easy as it looks. That’s why it’s best to leave the repairs, maintenance, and installation services to the professionals at AC Express Heating & Cooling LLC. Need heating repair or system maintenance? Call us! Our technicians will come to your house, troubleshoot your heater, diagnose the problem, and replace your old unit if necessary. We offer an array of heating systems and parts, including gas and oil furnaces, evaporator coils, controls and thermostats, and more. We carry products from all the major brands in the heating industry, including Carrier. Don’t wait until it’s too late. Be sure to have your heating system serviced each year to make sure it’s running to its best ability. Call AC Express Heating & Cooling LLC today to schedule your heating repair in Clemmons or Winston Salem, NC!